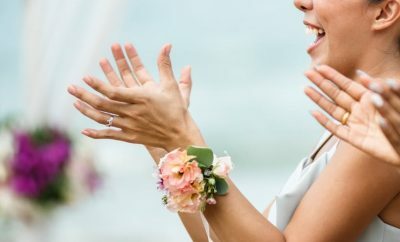 Hannah Graham cried tears of joy on her spring wedding day when she set eyes upon Adam Stevenson who was waiting for her intently at the top of the aisle. 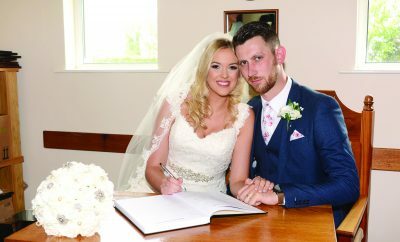 The pair were wed in an emotional ceremony on March 31, 2018 at Trinity Presbyterian Church, Omagh. The service, which featured beautiful music, was performed by the Reverend Robert Herron. 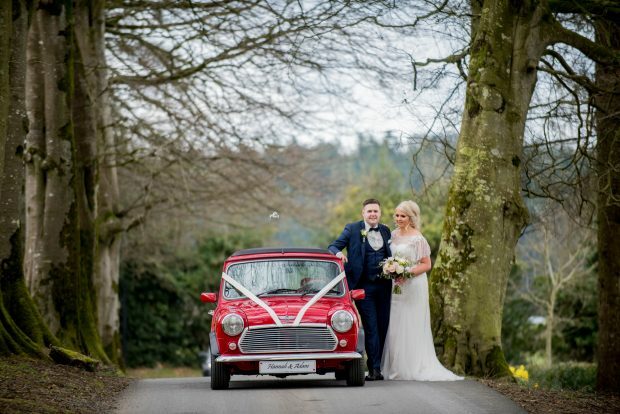 Their wedding reception took place at Corick House Hotel, a venue settled snugly within the Clogher countryside and favoured by the newlyweds due to its modern decor inside and close-to-home location. 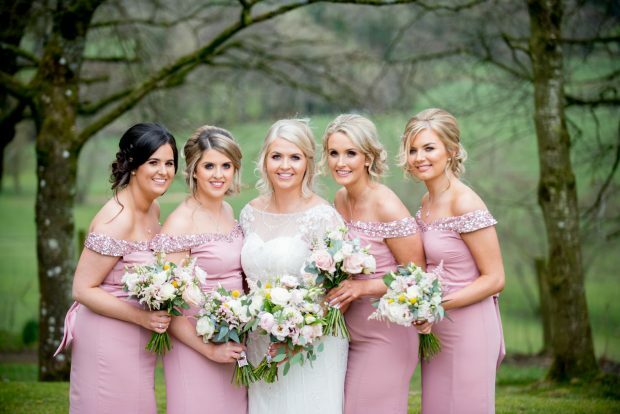 Bride Hannah Stevenson, alongside her bridesmaids Rachel Graham, Emma McGrath, Sarah Crawford and Rebecca McCauley. Hannah, who is a childcare assistant from Killyclogher, first met Adam on a chilly night out in Sally’s in December 2012. “We met through a mutual friend that I had known since primary school, and that Adam knew from the South West College,” she described. 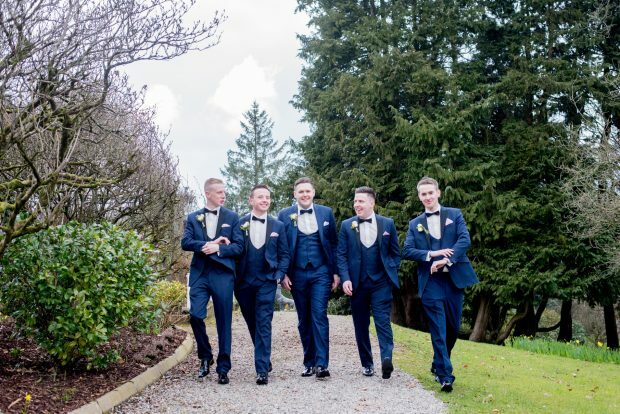 Adam Stevenson is all smiles on his wedding day, alongside best man, Daniel Sawyers and groomsmen, Aaron Carson, Adam Jeffrey and Adam Moore. It was on Adam’s 22nd birthday that the Omagh business banker got down on one knee during a scenic trek up Bessy Bell mountain. And while the rest was much appreciated by Hannah, the special moment took her completely by surprise. “Adam proposed a few days before we were graduating, and we had plans to start a new adventure in Australia,” she said. “So Adam insisted he wanted to trek to the top of Bessy Bell as it was his birthday. I reluctantly obliged. “I was admiring the view, having only made it to the windmills. And after moaning and complaining the whole way up, I was completely shocked to turn around and see him down on one knee amongst the brambles, with a ring in his hand.” Adam had thoughtfully chosen a simple and traditional engagement band for Hannah, which featured a single sparkling stone. As planned, the newlyweds-to-be moved to Australia shortly after their engagement on June 24, 2016 which delayed their wedding planning. However they decided to move back to Ireland four months later as Hannah was feeling homesick and she couldn’t find work. Adam, son of Maurice and Diane Stevenson, wed Hannah, daughter of Eric and Susan Graham, on March 31, 2018. 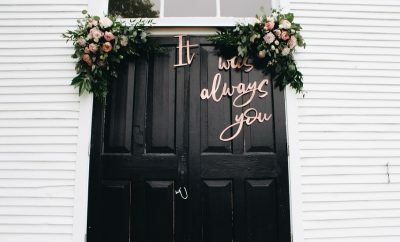 “We began looking at wedding venues after Christmas when we returned home, but I lost my dad suddenly at the end of January 2017 so the planning was put on hold for the foreseeable future,” said Hannah. 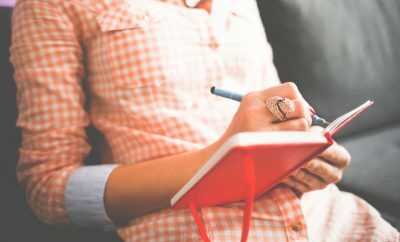 “However my mum encouraged us to set a date, and that gave us a great focus and something to look forward to. 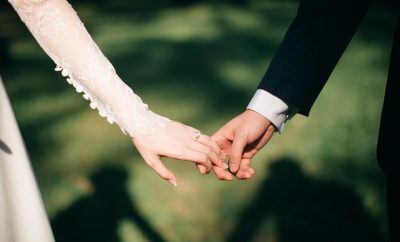 Even though Hannah had simply no clue about what type of wedding dress she wanted, she found the perfect one for her in the first and only shop she visited – Chantilly Lace in Enniskillen. “My dress was a fitted art deco style with lots of embellishment, and it went all the way to the floor with a short train,” Hannah reflected. 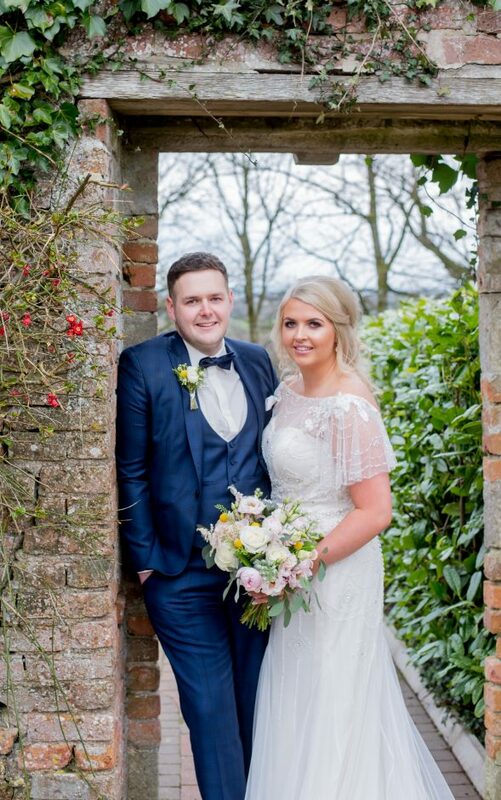 The newlyweds celebrated their beautiful wedding in Corick House Hotel in Clogher – a venue nestled neatly in the countryside. Hannah recalls feeling ‘relaxed’ on the whole run-up to the wedding, and her calm temperament remained even on the morning of her big day. “I was excited more than anything, and I suppose I just couldn’t believe I was actually getting married,” she said. 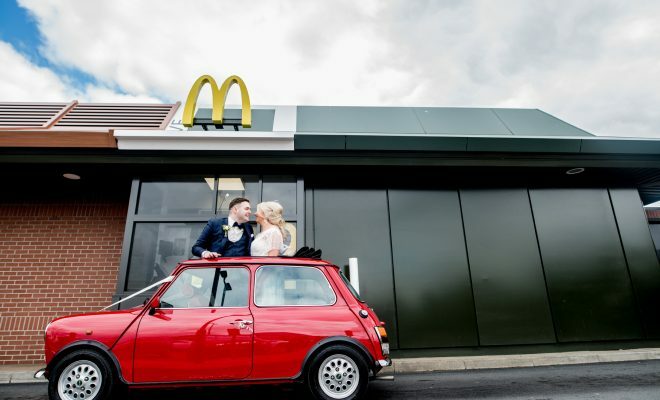 Hannah was whisked away to the church in her uncle Gareth’s red vintage Mini, along with her uncle David who would be giving her away. “The service was a bit of a blur – it flew in,” Hannah said. “I broke down when I was walking down the aisle and saw Adam for the first time. “I think I was just overwhelmed. I also got emotional when I was saying my vows, and I kicked myself after as I was determined I wasn’t going to cry. But I suppose it was an emotional day for a lot of people. 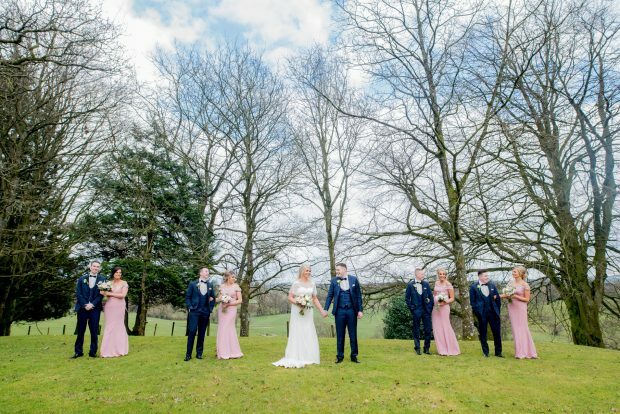 The newlyweds Hannah and Adam Stevenson, alongside their best man, Daniel Sawyers, bridesmaids, Rachel Graham, Emma McGrath, Sarah Crawford and Rebecca McCauley and groomsmen, Aaron Carson, Adam Jeffrey and Adam Moore. 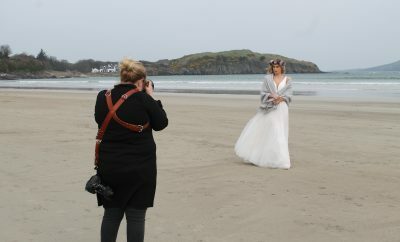 Wedding dress: Chantilly Lace, Enniskillen. Hair stylist/salon: Amy Nesbitt from Hi Tec hair salon. Head piece/ Veil: Chantilly Lace, Enniskillen. suits: Tomorrow’s Bridal and Menswear, Derry. Florist: Nettles Petals (Roisin McAtee). 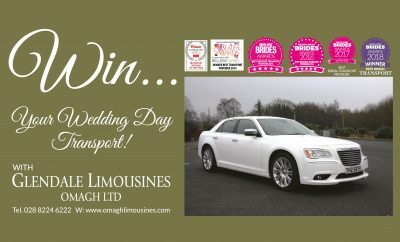 Transport: Sunny Bank Wedding Cars andGlendale. 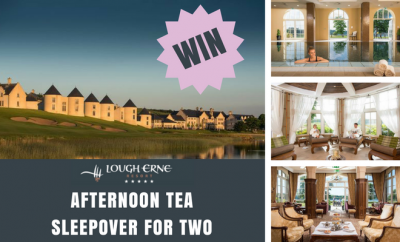 Reception: Corick House Hotel, Clogher. Number of guests at reception: 140 guests. First dance song: ‘Perfect’ by Ed Sheeran. Videographer: Infinity Films (Stuart McColm). Other entertainment: Chocolate fountains, WPM. Honeymoon: New York for three days, and a cruise to Orlando and the Bahamas for seven days.